Cold packs or medical cold packs are made and used in a variety of different ways. Cold packs are typically used in regards of medical treatment. Many athletes used cold packs to heal from any injuries. Furthermore, cold packs are used to keep medications cool for a given period, such medications include vaccinations. Cold packs contain a liquid inside, in most cases its water. In addition the water is mixed with a salt, which allows the cold pack to stay cool. The mixture that occurs between the salt and the water causes an endothermic reaction, which means that heat is absorbed. Due to the heat absorption, the temperature of the solution will decrease substantially. The cold pack experiment lab allowed us, the students, to apply theories learned in class to actual real life experiments; such experiments prepare us for future tasks the will be put forth to determine. Our main trajectory through this assignment was to determine what our unknown salt was, through experimental analysis. The main purpose of this lab was for us to determine what the given unknown salt is. For this experiment, my group and I were given unknown salt 7. Information recognized before starting the lab, were the materials needed, background information on the math required to determine the unknown(s). In addition, other background sources before starting the experiment included having previous knowledge of chemical formulas, understanding concepts learned throughout class and how a calorimetry works. Furthermore in order to determine how to complete the lab, we needed information upon how to properly keep the temperature of the water from decreasing or increasing, and this required that we needed to know what an insulator is and how to use it. To base a conclusion on what the unknown variables are, we needed to determine how to start and complete this experiment. To being with, we completed this activity by taking two of the three foam cups and placing them into each other. The foam cup inside the other cup will hold our water, while the other acts as an insulator, to prevent heat from escaping. Secondly, we used a graduated cylinder and measured 25.0-ml of water into it and put the water into the cup. After that we place the third cup, over the other two (acts like a cover) and put the thermometer through the top of the cup (This helps us determine the temperature of the water). Lastly, we measured the 3.0grams of our unknown salt and placed that into the water, letting it dissolve, and measured the temperature. Percent error= Theoretical yield-Actual yield x100. As you read on, every equation will be examined and explained on what they mean and how they will be used. The materials required in order completing the lab included goggles/eye wear; this will help prevent any type of harmful substances that we worked with from damaging your eyes. Three Styrofoam cups, the cups helps make an insulator and create the calorimeter. The thermometer was required in order to determine the temperature of both the water and the unknown salt. A weighing boat was also another source of material needed, in order to place 3.0grams of our salt. In addition, a scoopula and a scale were needed to help us determine the exact measurements of the unknown salt needed. Water was required to dissolve our salt into and measure the temperature of. A 100ml graduated cylinder was used to determine the accurate quantity of water required. Our unknown salt was another source of material given by our teacher, and this allowed us to complete the experiment. Other materials needed in order to complete the lab included paper towels. Gather all equipment/ materials to start procedure. Weigh the weighing boat, record the weight. Take two of the three foam cups and place them within each other to create an insulator from preventing heat to escape or cold air from entering. Take the 100-mL graduated cylinder and measure 25.0mL of water. Cut the third Styrofoam cup to fit the top of the first two cups. Read the temperature of water record it. Remove thermometer, add 3.0grams of unknown salt into the calorimeter. 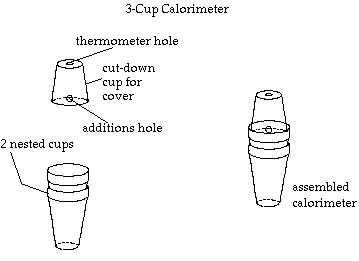 Let the salt dissolve and determine the temperature, by placing the thermometer through the top of the third cup. Before measuring the temperature, shake the cup to insure the unknown salt reacted/ dissolved completely. Determine the temperature and record results. Dispose of waste, clean the equipment and restart for the remaining two trials. Before beginning the calculations for the lab, we need to determine what possible equation we will have to use. The equation above is the change in temperature, represented by delta (âˆ†), which is the second temperature recorded subtracted by the first temperature recorded (T2 – T1). The equation above allows us to determine the q, which is the quantity of heat transferred, which equals the mass (m), multiplied by the specific heat capacity (c), and multiplied by the change in temperature (âˆ†T=T2 – T1 ). The equation above allows us to solve for the âˆ†H system. Once we determined the quantity of heat transferred, by using the equation q=mcâˆ†T, we can determine delta h by either replacing the q with mcâˆ†T, or place the result of q in the equation. The equation above gives us the average enthalpy for the number of trails that was conducted by our group. We add up all the Enthalpy of all trials and divide it by 3, to give the average. This equation allows us to determine the percentage error of our results. After calculating for our enthalpy, we can take the theoretical yield, found on page 347, table 1 in our textbook, we can subtract is by the actual yield. After determining the value of that, we divide it by the theoretical value and multiply it all by 100%. With the recording of all our data obtained from doing the experiment, we were able to form a chart for all three procedures and mathematically determine what the unknown salt was. Table 1: Temperature results and Change in temperature of water through three trails. From this chart above, we can see that we completed three trails to determine the exact value of the unknown salt, and to determine what the unknown salt is. In addition, we recorded our temperatures of the water before the salt was added (T1) and after the salt was added (T2). From that point we calculated the change in the temperature for each trail, with the equation, âˆ†H=T2 – T1. After determining our average enthalpy, we can determine what compound it is. Going into our textbook, onto page 347 and taking a look at table 1, we are given a list of compounds. The nearest compound our enthalpy is at is ammonium chloride. Ammonium chloride has an enthalpy of 0.277kj/g and we got an enthalpy of 0.256kj/g. using our knowledge based on rounding, we rounded up and made a conclusion stating that our compound was in fact ammonium chloride. Throughout the cold pack experiment not all our results were accurate. Our results weren’t as accurate because we stumbled upon some errors while completing the lab. One error that we encountered while completing this experiment and one that had an impact on our final results was the way our calorimeter was created. Through the experiment we were to assume that the calorimeter would create an isolated and insulated system, but in truth it didn’t. As we proceeded through the experiment of putting the water into our calorimeter, there was a possible moment when there was a transfer of heat in between the Styrofoam cups and the solution, in our case unknown salt 7. The stage when there may have been a transfer of heat, was not taken into account and this could of have caused an increase or a decrease in the temperature of our solution. As we already know that the reaction was endothermic and since it’s endothermic the solution absorbed the heat, from the cups and reaction. Such an error would cause a change in the temperatures of our solution to either increase or decrease. The result of this error had a medium impact on our final results. This was a medium impact because it not only affected our solution, but also the measurements we took. Resolutions to possibly prevent this error from occurring includes, taking account that the temperature may increase or decrease due to that fact it isn’t an actual isolated system. Another solution can include using different materials that would insulate the solution better. Our second source of error was taking the measurements of the water and measuring the accurate temperature of the water. When taking the measurements of the temperature of both the water and solution, there could have been an error from what we saw and what we wrote. Furthermore, since we don’t know whether the thermometer was actually inside the water, it could have not been touching it which in turn gave us the wrong results. An example could include is when taking the temperature of the water, the thermometer could have read 22oC and we could have seen it as 23oC or24oC. The result of this error had a medium effect on our data and due to this effect, our enthalpy wasn’t as accurate, and didn’t exactly match the ones in the textbook. When measuring the amount of water required dispensing in the calorimeter we need to use a graduated cylinder for accurate measurements. The cylinder was to give us the accurate measurement of whether we had exactly 25ml of water or not. The error in this measurement was for us to check with if it was exactly 25ml, and this may have resulted in either something less than 25ml or more than 25ml. The impact the source of error had on our final result was medium. The impact was medium because even though it did affect our final results, it didn’t affect it by a lot. It hadn’t affected our results by a large quantity because the difference between the solution we were supposed to get and the one we had, had a small margin of differences. The last source of error, that we hadn’t taken account for throughout the process of completing the experimental lab, may have had an impact on our final results. This error that affected our results was the fact that our unknown salt 7, was exposed to air for a periodic time. Due to a fact that the salt was exposed to air, it may have resulted in some of the salt reacting with the atmosphere. Due to this error, our results could have been incorrect because when massing the 3.0 grams, it could have reacted with the atmosphere, giving us 0.10 off, such as 2.90grams. This may not affect the results by a lot, but there would still be an effect on it. Another example of our results being affected by this includes that since some of our unknown salt reacted, when we measured the temperature it could have actually been either lower or higher than what we actually expected. For example, if the salt wasn’t exposed to the atmosphere we could have got a temperature of 18oC, but instead due to the fact it was exposed we got 20oC. The affect this had on our results and solution is a medium result. This is a medium result because if some of the unknown salt reacted, it would have been in such a small quantity, that it wouldn’t have a large effect on our results. Possible solutions from stopping this problem from occurring includes, either keeping the salt in an isolated room, put a tad more of the unknown salt in the water, just to counter act for the ones that reacted. In the mixed of completing the lab, we stumbled upon a mistake with determining the unknown salt. The mistake had an impact on final answer and wasn’t taken into account that it may possible have an effect on our final solution. The mistake that may have been encountered includes that our unknown source of salt, when added into the water, may have not dissolved properly. This resulted in the reaction not taking place to dissolve the entire product, which may have affected the temperature that was measured. Due to the fact that the salt wasn’t dissolved and it didn’t participate in the reaction, the temperature we may have taken could have been only the waters temperature. This source of error had a large effect on our solution because we had no way of determining whether it dissolved or not, without tampering the solution. Furthermore, due to the fact of the error, we may have been given the wrong temperature of the solution that in turn gave us the incorrect results for the enthalpy. In accordance, not only will we have been given the incorrect enthalpy, but the results were affected as well. In order to prevent this source of error from occurring again, what I could do is, while the unknown salt is in the water, I could stir it to dissolve properly; another method can include is to shake the calorimeter to dissolve the salt. When shaking it, I would hold it from the top to prevent heat transfer from my hand and the water. In conclusion, this experiment allowed us, the students, to use theories learned in class to real life applications, or real life applications that we will soon encounter. The lab better prepared us for what may be expected in the future, and allowed us to determine different factors that affected our results in more than one possible way. The cold pack experiment lab that was conducted by my group and I, had resulted in us facing errors such as measurement errors, errors including the calorimeter and errors including our unknown salt. These errors were recorded and explained to better help us prevent it from occurring again. By following the correct procedure and having the correct materials required, we were able to determine the final enthalpy. That allowed us to determine what our unknown salt was, which was ammonium chloride. Kessel, Hans Van. “The Bohr Atomic Theory.”Nelson Chemistry 12. Toronto: Thomson Nelson, 2003. 174-76. Print. "Determination of Unknown Salt Experiment." UKEssays.com. 11 2018. All Answers Ltd. 04 2019 <https://www.ukessays.com/essays/chemistry/determination-unknown-salt-experiment-7479.php?vref=1>. "Determination of Unknown Salt Experiment." All Answers Ltd. ukessays.com, November 2018. Web. 20 April 2019. <https://www.ukessays.com/essays/chemistry/determination-unknown-salt-experiment-7479.php?vref=1>. UKEssays. November 2018. Determination of Unknown Salt Experiment. [online]. Available from: https://www.ukessays.com/essays/chemistry/determination-unknown-salt-experiment-7479.php?vref=1 [Accessed 20 April 2019]. UKEssays. Determination of Unknown Salt Experiment [Internet]. November 2018. [Accessed 20 April 2019]; Available from: https://www.ukessays.com/essays/chemistry/determination-unknown-salt-experiment-7479.php?vref=1.